The Forerunner 201 offers athletes an easy-to-read display, ergonomic wristband, and integrated GPS sensor that provides precise speed, distance, and pace data. It's a compact, lightweight, accurate training assistant with performance tracking, auto-lap, auto-pause and more. The Forerunner 101 offers athletes and recreational walkers and runners an entry-level personal training device with GPS. It has the same features as the Forerunner 201, but operates on two AAA batteries and has no computer interface. The Foretrex 201 is a wearable Personal Navigator, Sporting an ergonomic wristband, the Foretrex 201 is similar in design to the Forerunner 201 yet is chocked full of GPS navigation features found in Garmin's popular Geko 201. The economical Foretrex 101 is the wrist-mount GPS that frees up your hands so you can focus on your outdoor activities. 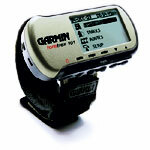 This product joins the Foretrex 201 in Garmin’s growing line of wearable, wrist navigation devices. 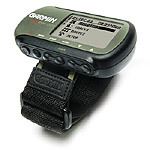 The Foretrex 101 has all the features and functionality of the Foretrex 201, including PC interface capabilities for downloading waypoints, tracks and routes, but operates on two AAA batteries.